Emirates has announced a new sale which will target honeymooners and the top-end of the market out of Dublin. 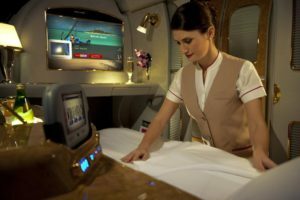 It’s claiming discounts of over €1,100 for First Class passengers travelling together on its route network via its Dubai hub. First Class passengers can save up to €841 per person on fares to the honeymoon destination of the Seychelles and up to €896 off the price of each First Class fare to Australia. 2, a couple can save €1238, or €2476 for four people travelling together. It said four travelling to the business destination of Tokyo will save up to €4,884 when they’re travelling up front in the cabin. However, fares must be booked by January 31.